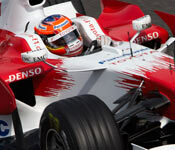 Toyota is rules by mixed feelings after the Friday practice sessions. While Jarno Trulli had a trouble free day and made good progress, Timo Glock could not find the right balance on his Toyota. Both drivers are still evaluating tyre performance towards qualifying and the race. "It was a good, productive day for us. In general the car seems to be behaving well. We tested several things, both mechanically and aerodynamically, and we made some good progress on set-up and balance. We also did some long runs which will help us to understand about the behaviour of the different tyre compounds. Everything went smoothly so I am happy. Now we will keep pushing to get the most out of these last two races and bring as many points away as we can." "Both sessions were a bit tricky for me because I've found the car quite difficult to drive today. I haven't found the right direction to go yet in terms of set-up and it has been hard to find the right balance. But we will work hard on the information we collected today and try to make an improvement for tomorrow. I know this track from 2004 when I raced here for Jordan, I've been impressed with the reaction of the fans here and now we must look to get a good result." Dieter Gass, Chief Engineer Race and Test: "Overall I'm really happy with the day. It was a very similar Friday to what we had last weekend in Fuji where we were performing well. Again, we did some basic work on both cars in P1 which set us up well for P2 and the rest of the weekend. The track evolved but not as much as usual here in Shanghai and we were able to gather a lot of information on the tyres. We had no major problems and we're obviously in good shape on car performance. Timo was struggling a bit more than Jarno with an inconsistent balance but we are confident that we can improve his situation for tomorrow. Now we can look strongly to the weekend and try to improve on what we saw in the race in Fuji."